Each suit has a different main color: Mostlyit is purple for clubs, yellow for spades, red for hearts and blue for diamonds. Jacks: Jack of Clubs holds a lance, Jack of Spades holds a sword, Jacks of Hearts and Diamonds hold a halberd. Queens: Queen of Clubs holds an open fan, Queen of Spades a closed one, Queen of Hearts and Diamonds hold their right hand at the neckline (in some versions Queen of Hearts holds a rose). 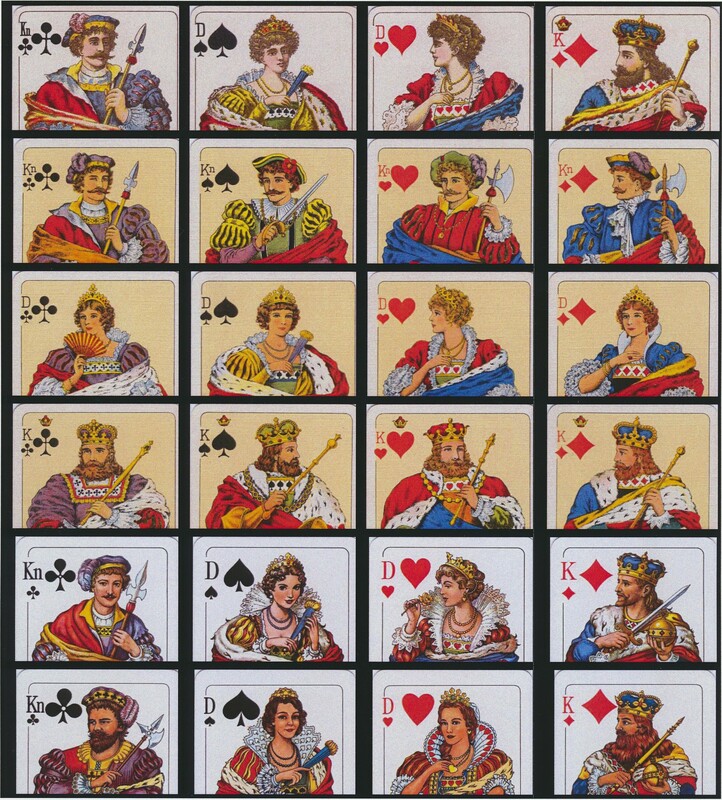 Kings: All Kings hold a sceptre, Kings of Clubs, Hearts and Diamonds in the left, King of Spades in the right hand (not always the same hands, in some versions complemented by an orb, sometimes King of Diamonds with a sword). 52 cards, Ace, King, Queen, Jack, 10 to 2 (or 53 and more cards depending on the number of Jokers). J.O. Öberg & Son, Eskilstuna; AB Akerlund & Söner, Stockholm; F.X. Schmid, Vereinigte Münchner Spielkarten-fabriken, Prien; Carta Mundi, Turn-hout; Ferd. Piatnik & Söhne, Wien; TACTIC, Finnland; Altenburger und Stralsunder Spielkartenfabriken, Leinfelden-Echterdin-gen; Berliner Spielkarten, Darmstadt; Hera-clio Fournier, Vitoria; Nürnberger Spiel-kartenverlag, Zirndorf; Offason, Vittsjö. Jerremalm, Ali: Playing-cards from the Nordic Countries, Chartophilia Sueciä 2011, p.55ff; Jerremalm, Ali: De välkända figurerna, Kartofilen 1/99, p.7ff; Jerremalm, Ali: Die Spielkarten in Schweden 1892-1992, Köln 1996, p.74ff; Mann, Sylvia: All Cards on the Table, Leinfelden-Echterdingen und Marburg 1990, p.152ff; Janssen, Han: de geschiedenis van de Speelkaart, Rijswijk 1985, p.111. Top row: First version, J.O. Öberg & Son, Eskilstuna. Second to fourth row: Second version, J.O. Öberg & Son, Eskilstuna. Fifth row: Version of Ferd. Piatnik & Söhne, Wien. Sixth row: The “Olsen” version, made by F.X. Schmid, München. This page is maintained by John McLeod (webmaster@i-p-c-s.org) and Kay Stolzenburg (pattern-sheets@i-p-c-s.org).